Home Living & Working in Ibiza 26 Disabled Access Beaches in Ibiza, but Hotels could do better. 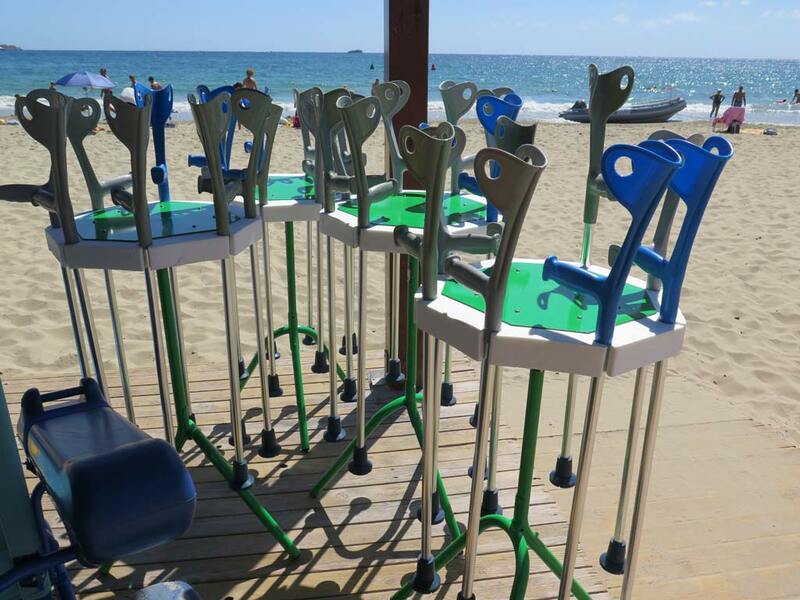 26 Disabled Access Beaches in Ibiza, but Hotels could do better. 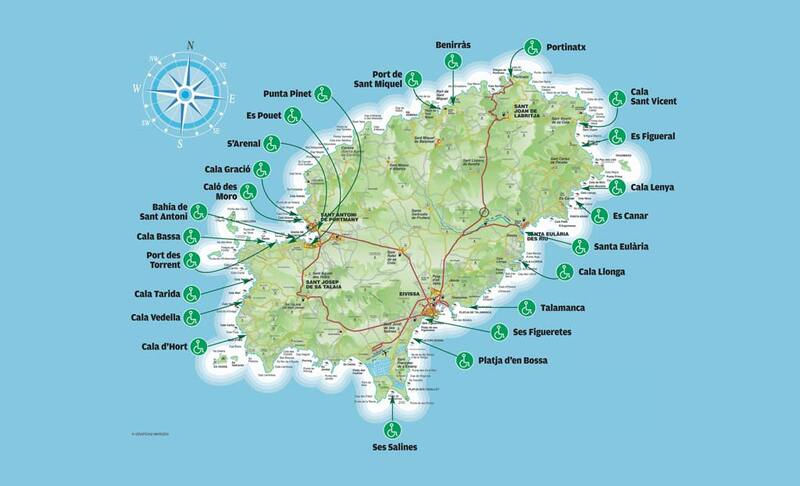 Ibiza now has 26 accessible beaches throughout the island. Most are fully accessible in that the user can get from their car, parking in a disabled bay next to the walkway, which will take the user directly to the water, or to the lifeguard tower where there are amphibious wheelchairs and crutches. Assisted bathing is also available in certain beaches, the advice is to book/warn the lifeguard tower in advance as extra lifeguards maybe needed and chairs may not be available if simply turning up. 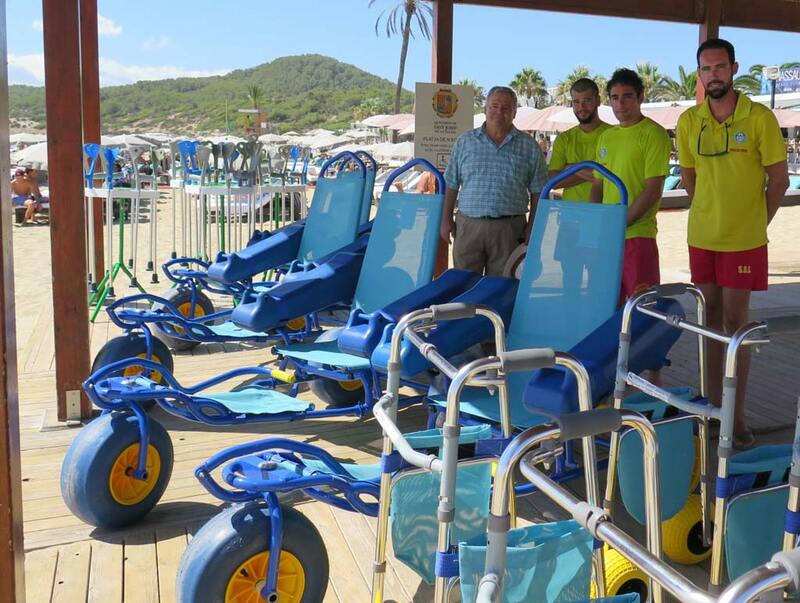 Santa Eulalia has two beaches which are fully accessible, Santa Eulalia itself, and Cala Llonga, both have amphibious wheelchairs and crutches located next to the lifeguard tower, the beaches have adapted bathrooms and showers with hot water. Santa Eulalia also holds certificates from UNE and Aenor for quality. “All the infrastructures are adapted. The person arrives with their vehicle, by bus or by taxi and the entire route allows them to reach the water without problems”, says Pilar Escandell, environment technician for Santa Eulalia. Last summer, the assisted bathing service offered by the Red Cross saw 170 calls for use, compared to just 25 in 2012. The service, which is offered between 11-2pm and 4-6pm, May to October. The assisted service lasts for 30 minutes. The municipality has other accessible beaches, without quality certificates. Cala Llenya, Es Figueral and Es Canar all have walkways, adapted toilets, shaded areas and parking next to the walkways. The Council are looking to make Cala Llenya ‘fully accessible’ within the next two years. Es Canar has amphibious wheelchairs; however it does not provide an assisted bathing service. San Jose offer assisted bathing service in eight beaches of the municipality: Platja d’en Bossa, Ses Salines, Cala Vedella, Cala Bassa, Cala Tarida, Port des Torrent, Punta Pinet and Cala d’Hort. In these cases, users should book in advance (at the lifeguard tower or call Call 663 261 367) so that they can get extra staff and not neglect the vigilance of other bathers. On the beaches there are six amphibious chairs, two plastic crutches with which people who have mobility problems but walk can enter the sea and four walkers. Marí explains that there are beaches, such as Cala Comte, in which they would like to implement it, but says that its orography is “difficult”. Cala d’Hort has had its disabled parking bays repainted and in Cala Bassa there are four places reserved for disabled users next to the walkway. The disabled parking bays are free and cannot be charged the 5€ parking fee at the entrance. San Antonio are yet to be certified for their ‘fully accessible’ beaches, and Diego Ponce stated that all beaches have accessible bathrooms except Cala Gracionetta and Cala Saladeta – both of which are difficult to access. Assisted bathing is offered in Cala Gració, Pouet, Caló des Moro and s’Arenal. The beaches all have ramps and walkways, as well as adapted shower modules and parking spaces. San Antonio also wishes to make their beaches more accessible for other disabilities i.e. posters in braille for the blind and other measures for those hearing impaired. Vila (Ibiza Town) has three beaches, Talamanca, Ses Figueretes and Platja d’en Bossa. They all have walkways, accessible showers and the assisted bathing service. Co-ordinator of the lifeguards Javi Montilla explained many users arrive spontaneously to use the service as they know it will be available. There are four accessible beaches – Benirràs, Portinatx (S’Arenal Gros), Port of Sant Miquel and Cala de Sant Vicent. They have walkways which reach the sea or amphibious wheelchairs from the lifeguard tower that can be used. The assisted bathing service is available daily throughout the season from 11am until 7pm. Es Arenal and es Pujols are the only beaches with amphibious wheelchairs. We wondered what disabled facilities would be available in Ibiza’s Hotels. We used leading specialist disabled holiday company Disabled Access Holidays to run some booking searches. We know that though wheelchair accessible rooms and shower facilities may not have reached the status of commonplace, they are out there. So we wanted to check on facilities that demonstrated a greater commitment to the inclusion of Disabled people in enjoying their holiday fully—and that has to mean the pool. We searched for hotels with a pool hoist and only a disappointing 3 were returned. 1) Apartments Duquesa Playa, Santa Eulalia 2) Azuline Hotel Coral Beach, Es Cana 3) Hotel Bellamar, San Antonio Bay. So unless Disabled Access holidays have missed some, there are just 4 hotels in the whole of Ibiza that have put their money up and gone above and beyond what is required of them. Well done those four, poor show the rest of you. And the conclusion for the disabled traveller? With 50% of Ibiza’s pool-adapted hotels, Es Canar is the place to be.